After beating Whitworth 78-57 the night before, the No. 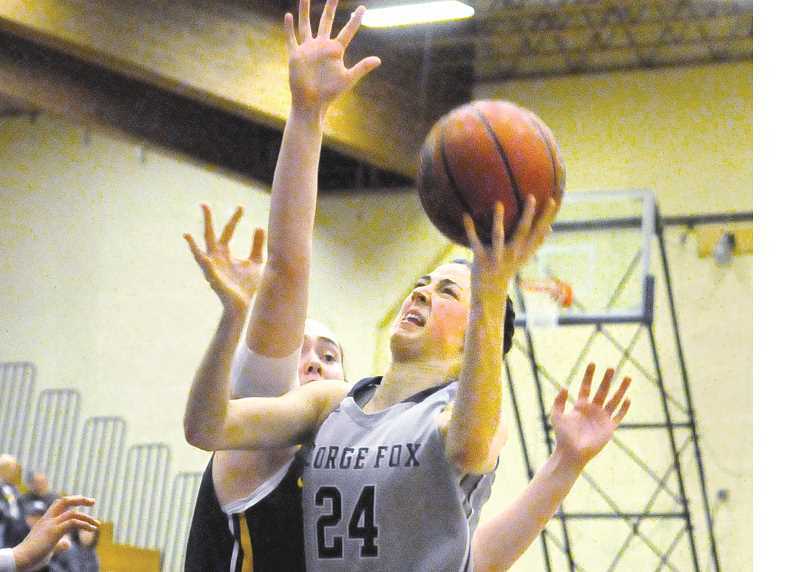 15 George Fox women's basketball team experienced its worst loss of the season Jan. 12, dropping a home game to unranked conference foe Whitman, 73-54. The Bruins (12-3, 5-1 Northwest Conference) shot a paltry 25 percent for the game — continuing a troubling trend for the team offensively as it enters the second half of its 2018-2019 campaign. "As coaches, we need to do a better job of putting our kids in better situations," GFU coach Michael Meek said. "We've got to focus on our shot selection, too, and knock down some shots. The No. 1 part of the game is getting good shots and making them." The game began with a frenetic pace, featuring myriad turnovers and fast break opportunities for both teams. GFU's shooting struggles were evident from the start as it shot 5-of-21 (23.8 percent) in the opening quarter. After the first quarter, Whitman led 17-15. A 10-0 run midway through the second quarter gave the Bruins a 27-23 lead, but the Blues regained control and took a 31-29 lead into the break. Whitman broke the game open in the opening minutes of the third quarter. An 18-5 run extended its lead to 49-34, a deficit from which the Bruins could not recover. The lead got to the mid-20s, but was whittled down to 19 by the final buzzer. Rebounding was a struggle for a smaller GFU team as the Blues enjoyed a 53-40 advantage on the glass. Despite committing 29 turnovers, Whitman showed flashes of efficiency on offense, picking up double-digit scoring from three players. Emily Spencer led the Bruins with 18 points, four assists and eight steals. Despite Spencer's efforts, GFU shot 19-of-76 from the field, including 3-of-26 from three-point range. Meek said the Bruins' schedule is only going to get harder as they play more road games down the stretch. The goals remain the same, however: Win the conference and make a run in the NCAA tournament. "Most teams are going to face adversity at one point in the season," Meek said. "This is really our first instance of that. We've had a couple losses, but we've played better and this adversity will really show us the character of this team." George Fox men's basketball has played tough against some the nation's top teams this season. The Bruins (10-5, 4-2 NWC) kept it close but lost by 11 to No. 1 Nebraska Wesleyan on Dec. 16 and dropped its game against No. 6 Whitworth by just three on Friday. Against No. 4 Whitman on Saturday in Newberg, GFU had the lead at half and was playing quality basketball before a second half collapse led to an 81-69 loss. Most of the game was encouraging for a Bruin team that has already surpassed its win total from last season, but coach Maco Hamilton emphasized that there are no "moral victories" in college basketball. "We need to start winning these type of games," he said. "But I love this team. We compete, we fight and we're connected. It's a great group and I think this weekend proved we can play with anybody. If we stay the course, we'll be just fine." 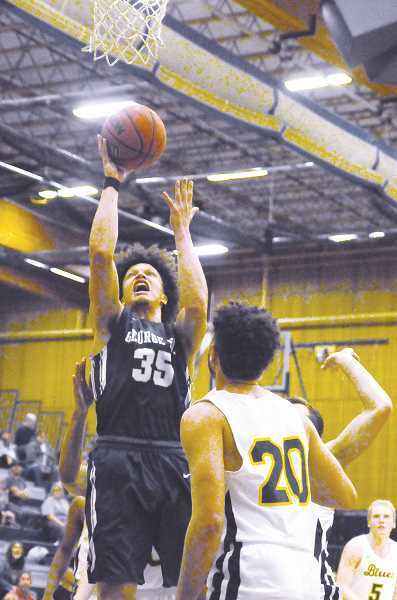 In the early going, GFU handled Whitman's full-court press with ease, finding cutters up the middle of the floor and smoothly transitioning into its offensive sets. The Bruins jumped out to a 13-9 lead with 12 minutes remaining in the first half. The lead hovered around five until the final minutes of the half, when Whitman began to develop a rhythm offensively and GFU's outside shooting cooled. At the half, GFU led 35-33 and the Blues were shooting a meager 28 percent from the field. As the second half progressed, the pace and energy of the game picked up as the lead repeatedly changed hands. Powerful dunks, well-timed blocks and steady three-point shooting filled the first eight minutes. It was 51-50 Whitman with just over 12 minutes remaining. Three minutes later, the Blues tightened their grip thanks in large part to some terrific defense, rattling off a 9-0 run to take a 60-50 lead. GFU was unable to claw back into the game as its offense became arrhythmic. Turnovers and poor shooting plagued the Bruins down the stretch as the Blues secured a 12-point win on the road. "I thought we did a great job defensively tonight," Hamilton said, pointing to Whitman's 38.9 percent shooting. "I also thought we played with poise against their press. In the second half, especially in the half court offensively, we had some bad possessions." Ryan Lacey led the Bruins with 20 points and 10 rebounds, supplemented by 10 points apiece from Wesley Reynolds and Jackson Januik. The team committed 25 turnovers and shot just under 41 percent. Despite a pair of home losses to teams it had a chance to upset, GFU appears to be making strides this season. Hamilton said the young Bruins are a "very mature" team. "They're tough, they're connected as a group, they're bought into what we do and they take ownership of things," he said. "Those four things carry over onto the floor." The GFU women and men each played a home game against Linfield on Tuesday night after press time. Look for a full account of the game in the Jan. 23 edition.